But only if you pay to. 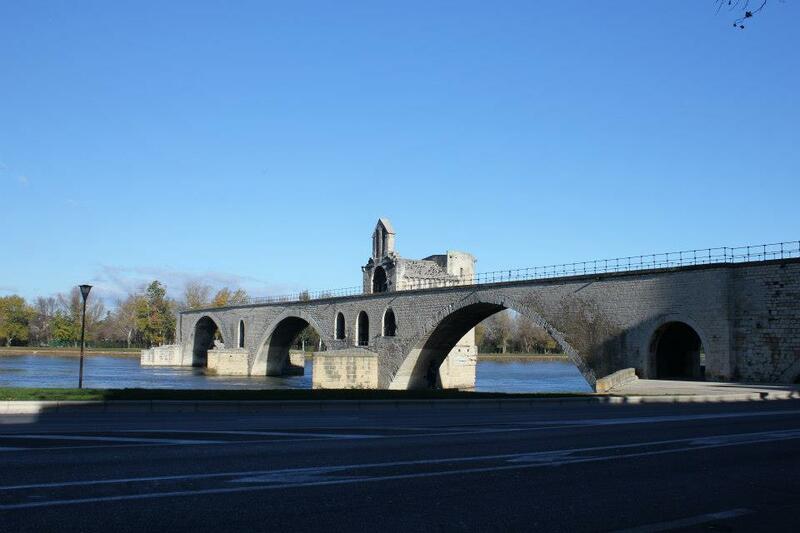 The bridge stretches only about a fifth of the length it used to, not even reaching the island-peninsula in the middle of the river Rhône which used to house gambling dens and all kinds of sinful endeavours. According to my ever-trusty guidebook, the original song was “Sous le pont d’Avignon“- not on, but under, describing the impatient dance of those awaiting tourists with light heads and heavy pockets. 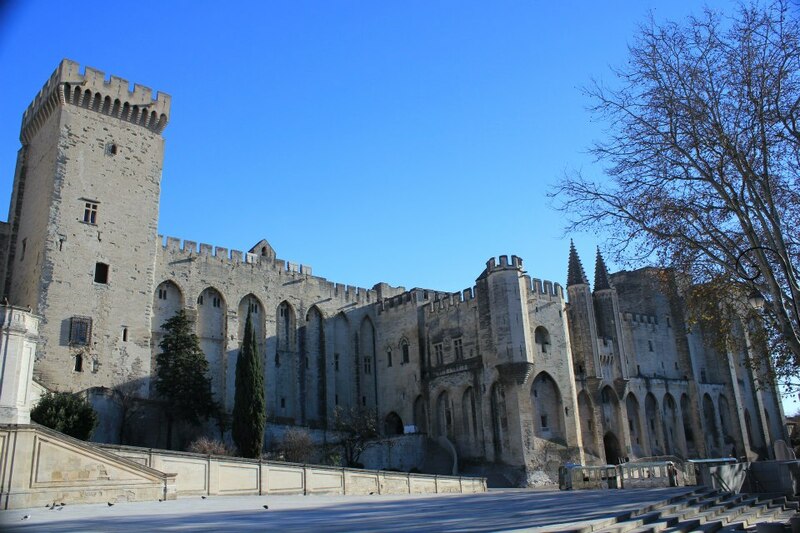 Not quite so heavy-pocketed, we got into Avignon on one of the windiest days I’ve experienced in France. Our guide explained that here we’re out of the shelter offered to Aix by the nearby mountains, so there will of course be more wind than we’re used to (actually, because of his accent, I at first thought he said that Aix was protected from wine (le vin) as opposed to wind (le vent)). The bridge is an impressive affair, even in its slightly depleted form, but not nearly as much as the Palais de Papes which stands- no- looms behind it. A golden, shining Mary stands beacon-like at its top, by far the most elegant thing for miles. The Palais itself, built around the 13th century, is not pretty on the outside. Impressive, very structurally sound and probably impossible to invade, but pretty it is not. But from looks alone even the Palais Vieux seems the best-kept middle-age fortress I’ve ever seen, its stonework rivalling that of the Mairie for colour and all-around just-washed whiteness. The rest of the town surrounding this mini-citadel makes up for any lack of prettiness. The Marchés de Noel, which at this time of year are a must for any self-respecting town, gave us a good place to start, as well as the obligatory French crèche in the town hall. A multitude of French-person figurines mill about their daily lives in traditional dress, their likenesses for sale in the markets outside next to macaroons, scarves and bags made out of zips. Those twisty turny French streets you’ve come to love are linked up to larger boulevards I’m starting to think of as more ‘anglophone’- a big, multi-laned road edged with shops, so our incredibly cultured and adventurous daytrip also featured a trip to H&M to buy snuggly jumpers. Out of the wind (the wine? the wind.) 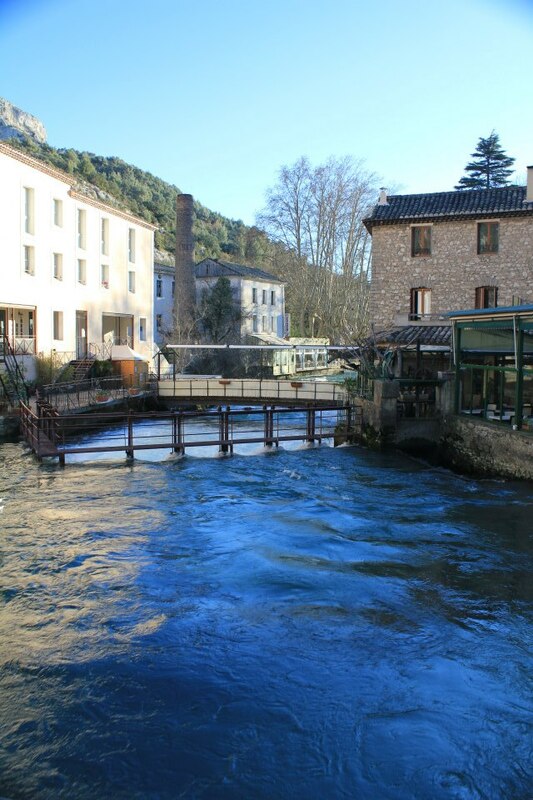 and on our wonderful tourbus again, we headed to Fontaine-de-Vaucluse, the source of the Sorgue River, and a nice couple of hours’ spent by a bunch of students used to living in a city centre. This is one of those villages made up of a few houses huddled around a river, surrounded on every side by tree-covered mountains and winding roads no reasonable busdriver should be expected to drive down. The source itself appears to be a deep pool coming directly out of a sheer cliff face, which then tumbles down rapids and runs off for 35 kilometres before joining the Rhône further downstream. It’s not much to look at this time of year, unless you’re really into kayaks and rapids. Looking at the sun setting on the mountains, the water rushing past and the precariously-balanced houses here and there, it’s not at all surprising that one of Europe’s greatest poets spent a good portion of his life here. The Italian Petrarch, who lends his name to a type of sonnet and is sometimes regarded as the father of Humanism, lived here for sixteen years- a long time in the 1300s- pining over Laura, the enigmatic subject of most of his love poetry. A Petrarch Museum in the middle of town is hidden away in the basement of a pub, and provides one of the few real tourist traps here. It’s nice to see the big cities of France, but it’s lovely to find these little secluded parts too, which seem to be the favourites of the world’s most celebrated artists.